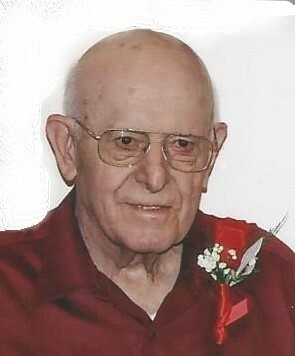 Obituary for John D. Meyers | Harold M. Zimmerman And Son Funeral Home Inc.
John D. Meyers, age 94, of Greencastle, PA died on Tuesday afternoon April 9, 2019 in the Chambersburg Hospital after a brief illness. Born December 26, 1924 in Antrim Twp., Franklin County, PA, he was the son of the late Harry S. and Bertha P. (Cline) Meyers. He married his wife Dolerene “Dolly” (Myers) Meyers on January 1, 1948. John was a retired self-employed plumber and also worked part time for 40 years at the Beachley Furniture Co. in Hagerstown. John was a member of the Mount Pisgah Lodge No. 443, F.& A.M. of Greencastle, member of the South Penn Scottish Rite Club of Harrisburg Consistory, member of the Frank L. Carbaugh American Legion Post #373 of Greencastle and a member of the Franklin County Builders Association. John was a US Navy Veteran of World War II and in his younger years he was an avid hunter. He enjoyed spending time with his grandchildren and great-grandchildren. Surviving family in addition to his wife of 71 years are three sons, Garry W. (Mary) Meyers of Ocala, FL, Daryl I. Meyers of Chambersburg, Keith J. (Vonda) Meyers of Greencastle; one daughter, Diane M. (Greg) McMichael of Lancaster, PA; eight grandchildren, ten great-grandchildren and one brother, Isaac W. Meyers of Madwaska,Maine. In addition to his parents, he was preceded in death by four sisters, Pearl K. Meyers, Martha Martin, Ethel Hawbaker, Elva Keener and four brothers, Harry Omar Meyers, Paul Meyers, Irvin Meyers and Mark S. Meyers. Funeral services will be held on Saturday April 13 at 10:00 AM at the Harold M. Zimmerman And Son Funeral Home 45 S. Carlisle St. Greencastle with Pastors Ronald Cook and Guy Baer officiating. A Masonic memorial service will be held at the funeral home on Saturday beginning at 10:00 AM with the funeral service to follow. Private interment with military honors provided by the Chambersburg V.F.W. Post #1599 Honor Guard will be in the Pleasant Hill United Brethren Church Cemetery near Greencastle. The family will receive friends at the funeral home on Friday evening from 6:00- 8:00 PM.